Windows comes stocked with ease-of-use features that let people with different levels of abilities use Windows. 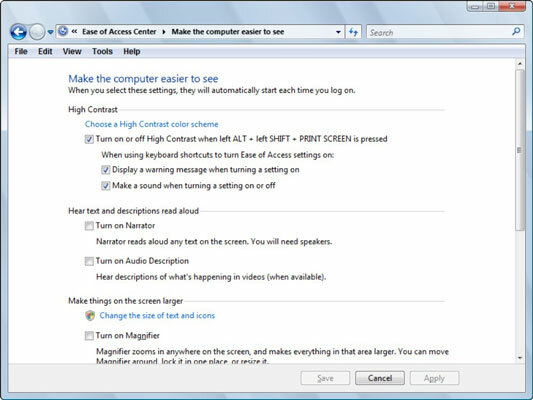 For example, you can optimize the visual display in Windows Vista to help visually challenged users to work with a computer, such as setting a higher contrast or using a Narrator to read the onscreen text aloud. Click the Optimize Visual Display link under the Ease of Access tools. This opens the Optimize Visual Display window. Select the check boxes for features you want to use. High Contrast: Creates a greater contrast between screen elements so they’re easier to see. 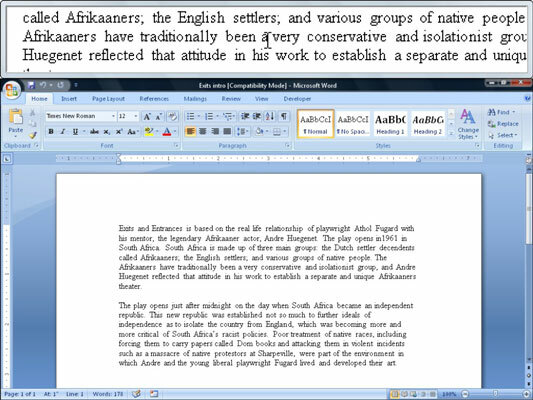 The Magnifier effect on your screen. Hear Text and Descriptions Read Aloud: Turn on the Narrator, who reads aloud any text on the screen, or have Windows describe what is happening in a video, if those descriptions are available. Make Things On Screen Easier to See: Here, you can enlarge the size of the blinking mouse cursor, get rid of distracting animations and backgrounds, and fine tune other display effects to your liking. When you finish changing settings, click Save to apply them.